A literary text seems in contemporary culture to be endlessly mediated by new media, as well as popular literature and pop culture. These spaces change the tone of relations between a text and its environment, creating a new perspective on the question of what constitutes an addition to the text and what function it performs. As a result of these changes, a peculiar system of varied elements– literature, film, animation, internet services, social media, comics, etc. – has arisen, whose signature factor is the gradual effacement of borders between its constituent parts. The text is ceasing to be a point of reference in this system and is instead becoming, for example, an addition to a film or to a sequence of computerized animation. Describing such relationships is not only a difficult task, but also a risky one. The most important problem we face in tackling it is the interdisciplinary nature of the phenomenon and the lack of a suitable methodology. Furthermore, representatives of various scholarly disciplines have attempted to develop a theory connecting literary texts, new media and popular culture and to endow them with a uniform character using various research tools. A typical feature of such theoretical endeavours is a certain kind of unification based on a terminology developed in order to cover the entire, complicated problem in its range. We thus have Marsha Kinder, who in her 1991 book Playing with Power in Movies, Television, and Video Games. From Muppet Babies to Teenage Mutant Ninja Turtles introduces two extremely significant concepts: the supersystem of transmedia intertextuality and the supersystem of entertainment. Then there is Henry Jenkins, who in Convergence Culture. Where Old and New Media Collide (2007) uses the term “transmedial storytelling,” which he defines in later chapters of the book as synergic storytelling. In cultural anthropology, on the other hand, and in works devoted to popular literature and pop culture, we find the concept of a cultural universe being widely used. The choice of the terms used above is not accidental. They make up the following algorithm: intertextuality → supersystem of transmedial interactivity → synergic storytelling → cultural universe. In this article, I shall illustrate the first three elements in the group using the Wachowskis’ trilogy: The Matrix, The Matrix Reloaded, and The Matrix Revolutions; the cultural universe I shall illustrate using a variety of examples from popular culture in its sense. 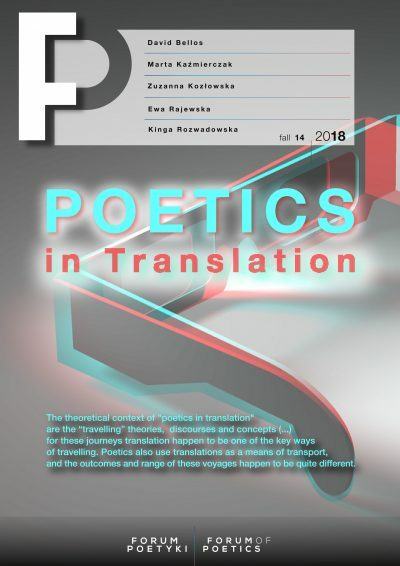 The terminology I have proposed relates not only to processes that take place between texts and their environment, but also situates in a new framework the concepts of intertextuality, transtextuality, pantextuality and the relationships we may, following Ryszard Nycz, call text-text, text-genre, and text-reality. I will thus reveal the dependencies of text and addition or text and environment in a completely new context: the context of a system in which the text constitutes one of the elements, constantly referring to the other parts of the group, and vice versa, the other parts of the group are constantly supplemented by the text. It is thus a path which, even from the perspective of a scholar of textuality may appear the final stage in the text’s metamorphoses. In one of the initial scenes of the film The Matrix (directed by Lilly and Lana Wachowski, Australia, USA 1999), Thomas Anderson, concealing himself under his hacker pseudonym Neo, receives three electronic messages: “Wake up Neo,” “The Matrix has you,” and “Follow the white rabbit.” Moments later the protagonist finds a book in which he hides devices containing illegally obtained data. For two thousand dollars, he hands over one of them to a contractor named Choi. The sequence concludes with a scene in a club where, amid psychedelic music, Neo meets Trinity. The sequence in question takes place between 7:00 and 12:00 in the film’s playing time. In a span of barely five minutes, the viewer is faced with an unusually eloquent intertext, the decoding of which occurs on three levels and in two dimensions: that of meaning or semantics (interpretative) and that of media (mechanical). The first level of intertextual references relates to the white rabbit presented in the form of a tattoo on the back of one of Choi’s female partners. It is a direct and easily decipherable reference to Lewis Carroll’s Alice’s Adventures in Wonderland. The second level is connected with the title of the book in which Neo hides the stolen data. In the film, we see only its title: the book is Jean Baudrillard’s Simulacra and Simulation. The third level exceeds the boundaries of the Matrix and involves the combination of some of the film’s dialogue with music – the song “Du hast” by the German group Rammstein. Significant here are both the text of the song and its video, directed by Philipp Stölzl. The three-level deciphering of meanings is thus based on connections between particular moments in the film and references to familiar works of literature and music. In the first case we have the above-mentioned Alice’s Adventures in Wonderland, in the second the works of Jean Baudrillard and the fundamentals of his philosophy, and in the third case allusions to the text of a song by the group Rammstein (the words: “Du…/Du hast…/Du hast mich…/Du hast mich…/Du hast mich gefragt/Du hast mich gefragt/Du hast mich gefragt und ich hab’ nichts gesagt”) and to the memorably powerful video for the song, inspired by Quentin Tarantino’s film Reservoir Dogs (US, 1992). The media dimension relates to the mechanisms by means of which the audience is able to decode the meanings described above. Those mechanisms base themselves not only on the viewer’s knowledge (for example of who wrote Simulacra and Simulation), but also on their perceptivity and reflexes. It is those capabilities, in fact, that allow viewers to catch brief sequences in the film, lasting only a few seconds, if that. The media dimension thus demands that the viewer engage to the extent of multiple viewings of individual scenes, re-watching shot by shot or even frame by frame. The most interesting aspect of these parts of The Matrix, however, is the function performed by the numerous quotations and references. The simplest way to explain the problem is to treat all of these allusions as signposts that serve to help find the answer to the question of the essence of the Matrix – a computer system that functions for the purpose of acquiring energy for machines. Morpheus asks, “What is the Matrix? Control. The Matrix is a computer-generated dream world built to keep us under control in order to change a human being into this,” holding up a battery in front of Neo as he speaks the last words. The real world exists outside the system, and what the inhabitants of the Matrix are experiencing is a mere phantom generated by a computer program. The reference to the philosophy of Jean Baudrillard and the concept of simulacra is remarkably eloquent in this context. Thus, the decoding of individual clues resembles a game played by the screenwriters and directors with the audience. It is important, however, that we return to the media dimension of The Matrix. The combination of all of the elements in a logical whole demands the spectator view the film multiple times and then connect all of the information acquired with the worlds of music, literature, art, and so on. The analysis above brings to mind the convention of palimpsest reading referred to by Gerard Genette in his discussion of the concept of hypertextuality. It is hypertextuality as a particular kind of transtextuality that, according to Genette, has in its way much in common with bricolage; “making something new with something old […].” Going further in this direction, we might ask what in this convention constitutes hypertext, and what hypotext, and what relations occur between these separate elements? Various references in The Matrix can be read primarily as intertextual, though many scholars would no doubt propose a discussion focused on traditional literary studies of influences, dependencies, and comparativism.. It should be noted here that most products of popular culture are treated as a mosaic of an enormous number of literary motifs and topoi, always viewed as derivative vis-à-vis the original. All such references and quotations thus become one of the basic mechanisms of contemporary culture. The Matrix has become a kind of cultural phenomenon, a cult sensation in the eyes of many. According to Marsha Kinder’s conception, the film can be defined as an entertainment supersystem, or more precisely a supersystem of transmedia intertextuality. Kinder inscribes the concept of intertextuality within the context of media studies, despite the fact that the methodological section of her work begins with references to texts by Julia Kristeva. According to Kinder, “intertextuality has come to mean that any individual text (whether an artwork like a movie or novel, or a more commonplace text like a newspaper article, billboard, or casual verbal remark) is part of a larger cultural discourse and therefore must be read in relationship to other texts and their diverse textual strategies and ideological assumptions.” Transmedia intertextuality is thus a kind of supplementation of intertextuality with a new system of signs: film, animation, computer games, morning TV shows, etc. A supersystem of transmedia intertextuality therefore signifies a new transmedial space of intertextuality, in which the process, mentioned in my introduction, of the gradual effacement of boundaries between particular elements in a system begins; this space is what Kinder calls an entertainment supersystem. Its characteristic feature is the way all intertextual references rely on viewers’ general knowledge. What is relevant is not so much the knowledge of a particular text as the ability to find it within medial space and connect it with other texts. It should be pointed out, however, that medial space, in Kinder’s understanding of it, directs the reader primarily toward television and the world of computer games – Playing with Power in Movies, Television… was published in 1991, and therefore does not deal with the media that have emerged in relation to the Internet. The transmedial storytelling that Jenkins sometimes defines as synergic storytelling is inscribed in the three main concepts of his book: media convergence, participatory culture and collective intelligence. The first of these terms encompasses various changes in technological, industrial, cultural, and social space that have led to a constant flow of information (content) between and among diverse media platforms. Unlike earlier theorists of media, Jenkins treats convergence as primarily a cultural concept, involving untold multitudes of consumers in processes connected with archiving, commenting on, appropriating and redistributing media content. His concepts are openly indebted to what is sometimes called the Canadian school of media studies (Harold A. Innis, Eric A. Havelock, Walter J. Ong, J. Goody, M. McLuhan, Derrick de Kerchove), and in a sense represent their embodiment, though it should be underscored that they do not share the technological determinism typical of McLuhan’s thought. Convergence is a paradigm shift based on the movement from content created within one medium toward information flows across various media channels. These changes are happening because of consumers and interaction among them that are creating a grass-roots participatory culture. Consumption is perceived by Jenkins as a collective process; following in the footsteps of French cybertheorist Pierre Levy, he subscribes to a theory that can be summed up in the following statement: “None of us can know everything [but] each of us knows something […].” That statement fully conveys the concept of collective intelligence, one of the pillars not only of Jenkins’s views, but also of the whole Web 2.0 trend or the paradigm shift referenced in the introduction to Convergence Culture. Transmedial storytelling thus joins together various media platforms into one shared organism, whose content is provided by consumers– system users. They work together through a constant exchange of information and collective intelligence. The condition for participating in the system is constant searching and engagement in processes of creating new content. Furthermore, each element in the group is equally important, and each should be fully recognized by every participant in the process. Contemporary popular culture can increasingly be defined as a complex of interconnecting and mutually completing cultural universes. Examples of such universes may include: Star Wars, Marvel, DC Comics, Lego, Transformers and many more. These systems, which encompass an aggregation of varied elements, remain in an ongoing, perpetual state of indefinition, endowed with form by the receiver. It is therefore better to say “the Lego Ninjago universe” than “the Lego blocks universe.” It is better to say “the Marvel universe” than to say “the Marvel comics universe,” because that system creates films, animation, toys, books, and so on. Blocks, which until recently were the main material produced by the Lego company, have now become part of a broader constellation. One of the latest proposals from the Danish company, the Lego Nexo Knights, includes, in addition to 28 sets: guides to the world of the Nexo Knights, bestiaries, catalogues, comic books, animated films and an entire arsenal of marketing additions disseminated across all possible distribution channels, among which internet apps have been playing an increasingly active role. Up until now, studies have focused on one particular product of popular culture, and all of its various additions were treated as accessories. The main element in a universe (a film, a series of comic books, a set of Legos, a particular character, story, or text) constituted the nucleus around which later elements assembled, those being interpreted as derivative with regard to the original entity. A similar situation could be observed when a literary text, due to its growing popularity, was supplemented with a variety of additional works: films, comic books, advertisements, amateur fan films on YouTube, fan fiction, etc. The concept of the universe, understood by me as a system of communicating vessels, almost entirely eliminates the concept of the “accessory.” An accessory can be, for example, an Optimus Prime T-shirt, mug, bed linens, watch, and so on. In a word, any form of the ubiquitous marketing that on the one hand promotes the product and on the other identifies the spectator with a concrete universe. If, however, the image printed on the T-shirt depicted a hitherto unknown adventure of the Autobot leader, then the T-shirt/accessory would cease to be an addition to the universe and would become a part of it – a text inscribed in the system and remaining in constant relations with other texts or elements in it. In Convergence Culture Jenkins claims that transmedial storytelling is the art of creating worlds. “To fully experience any fictional world,” Jenkins writes, “consumers must assume the role of hunters and gatherers, chasing down bits of the story across media channels, comparing notes with each other via online discussion groups, and collaborating […].” Jenkins, citing Pierre Levy, invokes the concept of a “cultural attractor,” which forms due to the obliteration of boundaries between authors and readers, producers and spectators, creators and interpreters. Jenkins himself uses the word “consumer” much more frequently than “viewer,” “reader” or “audience.” The concept, for him, is a basic element inscribed in participatory culture and constitutes a fundament of collective intelligence. Paul Levinson in his book New New Media goes yet one step further in this context. He proposes introducing a new paradigm based on the assumption that the foundation of contemporary changes in culture and society is the transition from the role of being a consumer of content to that of becoming a producer of it. It is precisely that change, according to Levinson, that constitutes the main caesura between new media and new new media. Unlike the entertainment supersystem and transmedial storytelling, the cultural universe is wholly mediated by new technologies, whose mechanisms and rules of functioning designate processes of creation, review, interpretation and dissemination of information. It is information, and not knowledge, that represents the point of departure for each analysis of the universe. There is no particular core (a text, film, or work of animation) around which all of the other elements revolve. This system presupposes only a beginning, which in the history of a given universe we may define as, for example, the premiere of the first film in the Star Wars series (Star Wars, dir. G. Lucas, US, 1977). A system user, who is simultaneously a receiver and transmitter, defines himself or herself the way the universe is built through the addition of successive parts of the aggregate. Among users there may only arise discussion concerning which of the products creating that discussion is canonical. The ability to combine those disparate elements, thanks to unlimited and multi-platform (computer, smartphone, television, and so on) access to computer networks, is becoming instantaneous. Everything can be checked and verified everywhere and at all times. Hundreds of places (digital spaces) exist where it is possible to publish, comment on, and create new parts of a system. Universes thus become both a new form of transmedial storytelling or of an entertainment supersystem, and their ultimate culmination. The article sets out to analyze new forms of relationships between a text and its additions: an entertainment supersystem based on transmedial interactivity (a concept developed by Marsha Kinder); transmedial storytelling (a concept taken from Henry Jenkins); and the cultural universe (my own concept based on the rich literature on the topic). 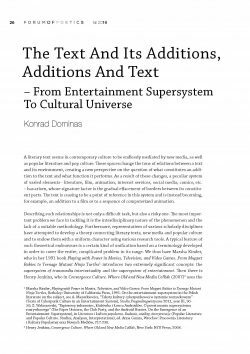 These theories are presented as a kind of process of obliterating the boundaries between textuality and mediality in contemporary popular literature and popular culture. Marsha Kinder, Playing with Power in Movies, Television, and Video Games: From Muppet Babies to Teenage Mutant Ninja Turtles, Berkeley: University of California Press, 1991. On the entertainment supersystem in the Polish literature on the subject, see A. Mazurkiewicz, “Teksty kultury cyberpunkowej w systemie rozrywkowym” (Texts of Cyberpunk Culture in an Entertainment System), Studia Pragmalingwistyczne 2011, year III, 30-50; Z. Wałaszewski, “Papierowy jednorożec, klubówka i Łowca Androidów. O powstawaniu supersystemu rozrywkowego” (The Paper Unicorn, the Club Party, and the Android Hunter. On the Emergence of an Entertainment Supersystem), in Literatura i kultura popularna. Badania, analizy, interpretacje (Popular Literature and Popular Culture. Studies, Analyses, Interpretations), ed. Anna Gemra, Wrocław: Pracownia Literatury i Kultury Popularnej oraz Nowych Mediów, 217-230. Henry Jenkins, Convergence Culture. Where Old and New Media Collide, New York: NYU Press, 2008. The concept of a cultural universe has been applied in various contexts and perspectives. See Literatura i kultura popularna. Badania, analizy, interpretacje; Literatura i kultura popularna. Badania i metody (Popular Literature and Popular Culture. Studies and Methods), ed. Anna Gemra and Adam Mazurkiewicz, Wrocław: Pracownia Literatury i Kultury Popularnej oraz Nowych Mediów, 2014; Dawno temu w Galaktyce Popularnej (Long Ago in a Popular Galaxy), ed. Albert Jawłowski, Warszawa: Wydawnictwa Akademickie i Profesjonalne, 2010; Jakub Z. Lichański, Wojciech Kajtoch, Bogdan Trocha, eds., Literatura i kultura popularna. Metody: propozycje i dyskusje (Popular Literature and Popular Culture. Methods, Proposals, and Discussions), Wrocław: Pracownia Literatury i Kultury Popularnej oraz Nowych Mediów, 2015. R. Nycz, Tekstowy świat (Textual World), Kraków: Universitas, 2000, 87-100. In the context of new analyses dealing with textuality, however, we should remember the words of Yury M. Lotman: “The development of scholarship at times puts certain words out; the avalanche-like growth of their frequency in scholarly texts is accompanied by a loss in necessary clarity of meaning. They do not so much function as terms for exact signaling of a scholarly concept as they signal the currency of the problem and point to the area in which new scholarly ideas are being born.” Yury M. Lotman, “Текст в тексте,” in Чему учатся люди. Статьи и заметки (What People Study. Articles and Notes), Moskva: Tsentr knigi VGBIL im. M. I. Rudomino, 2009. My translation—TDW. All quotations are taken from the following edition of the film: Matrix, DVD, Galapagos 2010. J. Baudrillard, Simulacra and Simulation, Ann Arbor: University of Michigan Press, 1994. The French-language original was published in 1981 (Éditions Galilée), and the Polish translation in 2005 (Wydawnictwo Sic!). This song does not feature on the film’s soundtrack but was included on the official soundtrack album The Matrix: Music from the Motion Picture (Warner Bros./Maverick, 1999) containing 12 songs relating to the Wachowskis’ film. Rammstein, “Du hast,” dir. Philipp Stölzl, official video webpage: https://www.youtube.com/watch?v=W3q8Od5qJio, accessed: 4 June 2016. The song “Du hast” was released in 1997, and was produced by Jacob Hellner and Rammstein. Written by Till Lindemann, it was published by Motor Music. Gerard Genette, Palimpsests. Literature in the Second Degree, trans. Channa Newman and Claude Doubinsky, Lincoln: University of Nebraska Press, 1997, x.
 Henry Markiewicz, “Odmiany intertekstualności” (Varieties of Intertextuality), in Wymiary dzieła literackiego (Dimensions of the Literary Work), Kraków: Wydawnictwo Literackie, 1996, 218. See Michał Głowiński, “O intertekstualności” (On Intertextuality), Pamiętnik Literacki LXXVII, 1996, no. 4, 76-77. See Anna Gemra, Introduction to Literatura i kultura popularna, 7-13. In the context of The Matrix references to cyberpunk literature are particularly prominent. See Adam Mazurkiewicz, Z problematyki cyberpunku. Literatura – sztuka – kultura (Problems of Cyberpunk. Literature, Art, Culture), Łódź: Wydawnictwo Uniwersytetu Łódzkiego, 2014, 337-340. Kinder, Playing with Power in Movies…, 1-2. Kinder, Playing with Power in Movies…, 2. In the course I have supervised called “Współczesna kultura jako supersystem rozrywkowy” (Contemporary Culture as Entertainment Supersystem), students of the Faculty of Polish and Classical Philology at Adam Mickiewicz University in Poznań suggested the following entertainment supersystems: Angry Birds, J.R.R Tolkien’s Lord of the Rings, contemporary election campaigns, the TV series Twin Peaks (created by David Lynch and Mark Frost, USA 1990-1991), Game of Thrones, (created by David Benioff and D.B. Weiss based on books and characters by George R. R. Martin, USA 2011-). The course was held in the academic year 2015-2016. The most popular service existing today, the World Wide Web was developed by Tim Berners-Lee and Robert Cailliau in 1989 at the Center for European Nuclear Research (CERN). In 1993 the first web browser, Mosaic, appeared, and was indispensable for viewing websites. The application was created at the National Center for Supercomputing Applications (NCSA) and became one of the most important elements in the web’s later commercialization. Only in 1995 did the American Federal Networking Council (FNC) introduce the definition of the Internet, while Google appeared on the WWW in 1997. See T. Berners-Lee, The World Wide Web: Past, Present and Future, https://www.w3.org/People/Berners-Lee/1996/ppf.html, accessed: 4 June 2016; http://www.google.com/about/company/history/, accessed: 4 June 2016; https://www.w3.org/People/Berners-Lee/1996/ppf.html, accessed: 4 June 2016; http://www.internetsociety.org/internet/what-internet/history-internet/brief-history-internet, accessed: 4 June 2016. In 2000 The Matrix received four Oscars, for the Best Special Effects (John Gaeta, Janek Sirrs, Steve Courtley, Jon Thum), Best Sound (David E. Campbell, David Lee, Gregg Rudloff, John T. Reitz), Best Editing (Zach Staenberg) and Best Sound Editing (Dane A. Davis). The Polish version appeared in the same year. The series consists of the following episodes: Final Flight of the Osiris; The Second Renaissance, Parts 1 & 2; Kid’s Story; Program; World Record; Beyond; A Detective Story; and Matriculated. For detailed information on the scenarists and directors, see http://www.imdb.com/title/tt0328832/, accessed: 4 June 2016. Jenkins, Convergence Culture, 95. Another example of transmedial storytelling could be Tarsem Singh’s Immortals (US, 2011). Together with the film, Archaia Entertainment released the comic book Immortals. Gods and Heroes (Los Angeles, 2011) – a collection of nine stories divided into two sections: Gods (five stories) and Heroes (four stories). These stories not only develop plot threads from the film, but also modify and transform them. Only after reading the comic book is the reader fully able to understand the conflict between the Olympians and Titans. A scrupulous analysis of the film in the context of the reception of ancient literature and transmedial storytelling can be found in my article “Bogowie i herosi w kulturze popularnej na przykładzie produkcji Wolfganga Petersena ‘Troja’ oraz Tarsema Singha ‘Immortals. Bogowie i herosi’” (Gods and Heroes in Popular Culture. Case Studies of Wolfgang Petersen’s Troy and Tarsem Singh’s Immortals), in Fantastyczność i cudowność. „Homo mythicus”. Mityczne wzorce tożsamości (The Fantastic and the Marvelous. Homo mythicus. Mythical Models of Identity), ed. B. Trocha, G. Trębicki, H. Kubicka, Zielona Góra: Oficyna Wydawnictwa Uniwersytetu Zielonogórskiego, 2014, 79-86. Jenkins, Convergence Culture, 9. See also: http://henryjenkins.org/2006/06/welcome_to_convergence_culture.html, accessed: 7 June 2016. See Dieter Mersch, Medientheorien zur Einführung, Hamburg: Junius, 2013; Éric Maigret, Sociologie de la communication et des médias, Malakoff: Armand Colin, 2015. Jenkins, Convergence Culture, 4. On the concept of collective intelligence, see Rafał Maciąg, Pragmatyka Internetu. Web 2.0 jako środowisko (Pragmatics of the Internet. Web 2.0 as an Environment), Kraków: Wydawnictwo UJ, 2013, 143-145. Web 2.0 is a trend relating to the range of how the Internet is used to create and manage content, the development of technologies and internet applications such as Ajax, Google Maps and others and the generation of profits through providing access to services for free. See Amy Shuen, Web 2.0.: A Strategy Guide, Sebastopol: O’Reilly Media, 2008, 13-16. H. Jenkins, Convergence Culture, 5-9. See Sean Howe, Marvel Comics: The Untold Story, New York: Harper, 2012. See also http://www.marvelcomics.pl/, accessed: 4 June 2016. The copyright for publication of any materials relating to the Lego Nexo Knights belongs to Ameet Publishing. See http://www.ameet.pl/kategoria-produktu/katalog/lego/nexo-knights/, accessed: 4 June 2016. In 2015, the Danish-American animated series Nexo Knights was created; it is broadcast on Cartoon Network. The Polish version premiered toward the end of 2015. On the official Lego Nexo Knights website, users can not only get acquainted with the world of the characters in the series, but also play multimedia games, watch animated films and even join the Nexo Knights Academy. See http://www.lego.com/pl-pl/nexoknights/products, accessed: 4 June 2016. Particularly notable is the fan fiction discussed by Jenkins in the context of J. K. Rowling’s series of Harry Potter novels. Jenkins, Convergence Culture, 168-193. See also L. Gąsowska, Fan fiction. Nowe formy opowieści, Kraków: Ha!art, 2015. The Taiwanese company ASUS, a leading producer of computer equipment whose name comes from the mythical winged horse Pegasus, has joined classical mythology, Taoism (the five virtues of ASUS) and a corporate policy based on precepts of “lean thinking.” On the company’s website we read: “ASUS takes its name from Pegasus, the winged horse in Greek mythology that symbolizes wisdom and knowledge. ASUS embodies the strength, purity, and adventurous spirit of this fantastic creature, and soars to new heights with each new product it creates.” http://www.asus.com/About_ASUS/The-Meaning-of-ASUS, accessed: 19 September 2016. For a precise analysis of this example in the context of the myth and its reception, see K. Dominas, “Internetowa recepcja mitu na przykładzie wybranych podań grecko-rzymskiej literatury” (Internet Reception of Myth: Case Studies of Selected Legends from Greco-Roman Literature), in Studia mitoznawcze. Współczesna obecność mitu (Mythographic Studies. Contemporary Presence of Myth), ed. I. Błocian, E. Kwiatkowska, Toruń: Wydawnictwo Adam Marszałek, 2012, 135-156. The idea of collective intelligence has been criticized in the works of Andrew Keen and Wojciech Orliński. See Andrew Keen, The Cult of the Amateur: How Today’s Internet is Killing Our Culture, New York: Random House, 2007, 7; Wojciech Orliński, Internet. Czas się bać, Warszawa: Agora SA, 2013, 119-147. Paul Levinson, New New Media, New York: Pearson, 2013. Levinson also considers the mutual, catalytic relations in spite of competition and the greater importance of new new media compared to the earlier services of web browsers and e-mail.